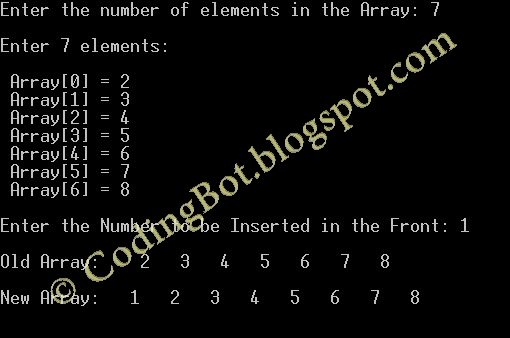 Let we have an array Arr having four elements initially Arr = 1, Arr = 2, Arr = 3, Arr = 4 and you want to insert a number 59 at first location, that is, at Arr = 59. So we have to move elements one step below so after insertion Arr 1] = 1 which was Arr initially, and Arr 2] = 2, Arr 3] = 3 and Arr = 4. Array insertion does not mean increasing its size i.e array will not be containing 11 elements, but instead inserting an element. NOTE:- If you want to insert an element into a full Array, that is, all elements are already present in the array, then element will be inserted but the last element will be terminated.